Just a tiny update that the design diary on rivers and roads is coming soon – as it was slated for today. Working on some annoying bugs with the new river code, and it’s delaying me from doing the screenshots and illustrations of the relevant concepts. Hopefully I’ll have the bugs finished soon so I can update this page with the intended post. I can sadly only do one thing at a time. As the last month of spring draws to a close, I feel it’s time for a short progress report. The last week I have worked on dungeon boss mechanics, construct customization and rivers/roads. In an attempt to better convey the development progress and the design work involved, the coming updates will break with the usual format of an alpha build and ‘wall of text’ release notes. Instead over the coming week or two, I’ll present a series of posts focused on each of aforementioned areas in turn. These post will explain the background of the feature, the current progress and the intended final functionality. This blog has been a rather wordy affair until now, with little in the way of screenshots, videos or concept art. I intend to remedy this shortcoming in these coming articles and provide some visuals. The first of these three post will be on rivers and roads, and will be posted tomorrow or the day after. The next subject is construct customization, a feature allowing a player to create custom golems and various other monstrosities. Not entirely dissimilar to the star ship designer found in many science fiction strategy games. And finally the dungeon boss feature will be highlighted, probably in conjunction with dungeon mechanics in general. The main mechanics change in this build is to Mana Nodes. They now have a cost to bind, which depends on the size of the node. The mana production numbers has also been rebalanced. It was very easy to amass crazy mana income without this, and starting close to large/massive mana nodes made an absurd difference. Enrage Wildlife has been changed from a basically useless hex state modifier spell, so that it now creates a roaming unaligned army of terrain/climate-specific beasts. Beware that the beasts will also attack your own armies and holdings, so casting this close to home serves best as a training exercise for your armies. Dungeon exploration will now result in progress towards clearing the dungeon. When this reaches 100%, there is no more loot to be had from exploring it. In a future patch, reaching 100% will allow sending a party to fight the dungeon boss, if any is present. World generation has had a lot of tweaks. Primitive/barbarian/tribal culture naming has been greatly improved. The province where the player starts will now be less crowded, but will always have minimum 1 dungeon. The number of cultures and independent cities generated has been tweaked to scale better with world size and generation parameters. Deity/cosmology generation has been improved. For example there are now usually a few lesser and/or demigods in the pantheon. Also, if a warrior or martial culture has been generated, a god of war will always exist. The info window now shows expected income/expenditure of resources, and shows the top 3 resources apart from the basic gold/mana/influence. In a future patch the resources shown will be configurable from the economy window. This window (the crate icon) is also where you can currently always see the full overview of all resources. Bug fixes: Zooming has been capped in both directions. Toggle favored follower works again. Fatigue/wound status text/icon has been cleaned up. Crash fixes. Rebels will now attack things again. Notification messages will no longer refuse to go away during the turn they appeared. Notification messages can be dismissed with right-click. Tooltips for notifications are much improved, and most messages can be read in their entirety from the tooltip, if desired. Arcane site income which was missing has been fixed. Generated content text capitalization, plural and spacing fixes. I have also made good progress towards getting load/save of games functional again, which it hasn’t been for a very long time. This sub-system is being rewritten to be less of a pain to maintain going forward. A small update with the added functionality of being able to hire new followers and workers, as well as mercenary regiments. The former were only available via events and research until now. Mercenaries are usually expensive, but can be a way to spend an overflowing treasury or gain access to more exotic or elite regiments. All three are accessed from the economy/market screen (the crate icon in the top menu). I have also improved the culture naming engine. No more generic “Feudal Men”, “Druidic Men”, etc. – barbarian/tribal cultures also have improved naming schemes. And finally, there is a 32-bit build available, for those not running 64-bit versions of Windows. If in doubt about your OS, try the 64-bit version first. This is finally the build where feature parity with the pre-Unity build (0.9.37) has been achieved. Apart from the cheat menu, which doesn’t really count, and might not come back at all, all user interface and mechanics are now implemented with equal or better functionality than previously. There are bugs, of course, and a lot of usability, polish, and graphical work to do, but from now on it’s about improvements and new features, rather than catching up. Speaking of new features and mechanics, this build actually has some: The prices on the market now adjust dynamically. Selling or buying a lot of a resource will shift the prices in the relevant direction. The siege mechanics have been improved – armies need to siege some settlements and all fortresses for a period of time before they can be assaulted. The AI also abides by this. Rebel AI and mechanics have been expanded – there are some bugs though with independent city rebels and not properly reforming/rejoining the relevant minor city faction. On the “content” side, there are improvements to the naming engine and a new event, suggested by Frumple from the bay12 forums. I won’t spoiler it with further details, but it’s related to wild magic, summoning and chronomancy. Was really good fun to create. Finally there are a number of UI improvements and bug fixes. The highlight of the UI work is that the overland construction project UI is now functional again, and more usable than previously. A number of icons, notifications and dialogs have also had improvements. Even though 0.9.37 feature parity has finally been reached and stability is looking good, please hold off on bug reporting yet. I will add improved logging and an in-game link to bug report generation in one of the next builds. Getting the save game functionality activated again is also becoming ever more inevitable, and will be invaluable for reproducing bugs. To celebrate Mother’s Day, I’ve added a Mother-Earth/Gaia type of deity to the mythos generator. The exact nature of this deity is semi-random, but will tend to align with nature/earth/life/agriculture/etc, randomized and dependent on the other world generation results. The world spell casting UI has also been added – more accessible than the old clunky magic interface from 0.9.37. A “Cast Spell” button will open a list of spell icons, and tool-tips show effects and costs. Click the spell, select the target, confirm and then let the mana flow as you rain down fire, enrage local wildlife or empower the furnaces of a city. The graphical and audio side still needs work – animation, particles, etc. But you can cast spells directly form the world map now, which I think is a great improvement. As usual I’ve fixed some of the crash/hang bugs introduced when porting to Unity. Finally, more messages/alerts have been added, user interface polish added in a few places (e.g. new cursor graphics) and the random world generator given some improvements. This update is primarily bug fixes and UI fixes/improvements. The Military dialog had quite a few bug fixes and a few hangs were fixed. Various elements of the main world interface have been re-positioned, more icons have text, and a few bits have also been prettied up. 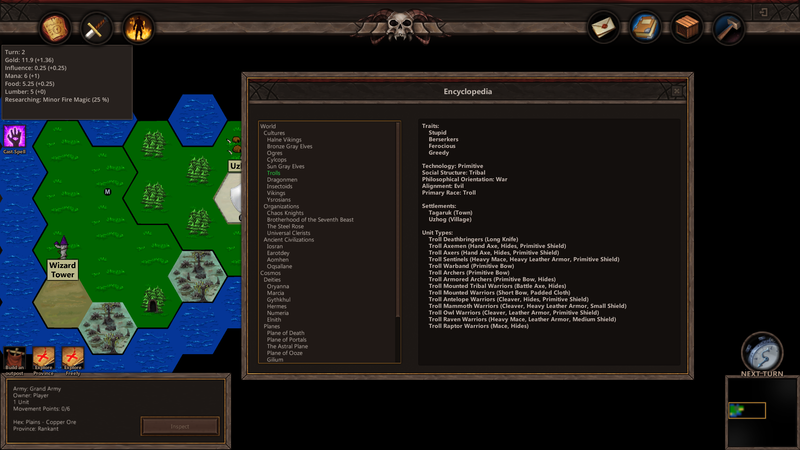 Other improvements relate to army selection and cycling through multiple selectables in a hex. As for new functionality, the Diplomacy window is in. It shows the other powers of the world – wizards, warlords, organizations and independent realms. Diplomatic relations, cultural information, a few statistics and emissary assignment is also visible from this screen. Shortcuts for various diplomacy and espionage related actions will be added in the future, as an alternative to launching these directly from the world map. Next up is more UI improvements and a world spell casting interface, possibly tying into a way to go into more detail with the research mechanics/information. Even though this build is a lot more stable and usability has taken great strides forward, feature parity with 0.9.37 is not there yet and there are known bugs. So it’s still too early to report bugs. But feel free to try out the build and see where the game is heading. There is a decent chance that the next build will have feature parity, and I can finally begin talking about/working on, actual new features and game play.